Our photo of the week for this week is one I took of the Kissing Tower in Hersheypark. If you have ever visited Hershey Amusement Park in Pennsylvania or have driven through Hershey PA, I am sure you have seen their world famous Kissing Tower which can be seen for many miles away. Back in 1985, my then boyfriend (now my husband) took me on a date to Hersheypark and he kissed me for the very first time when we were at the top of the Kissing Tower. Wow, what a great memory even after all of these years! 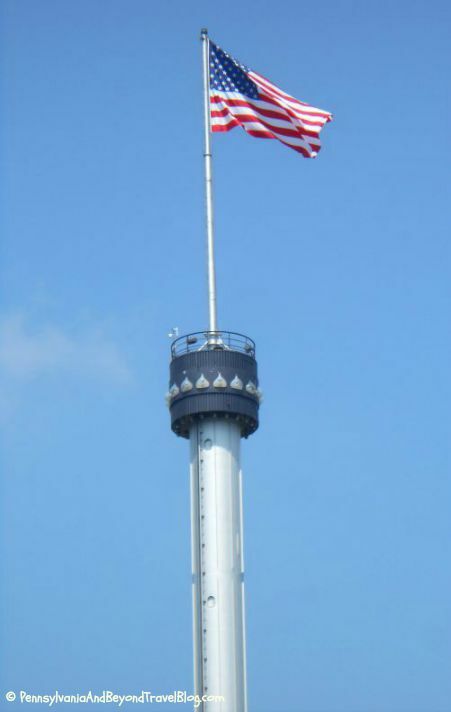 Every year when we go back to Hersheypark, we always take another ride up in the Kissing Tower and when at the top...you guessed it, I get another kiss! yeah! I think it has brought us great luck during our 30+ years of marriage! Well, there you have it! Our special "photo of the week." You can learn more about visiting Hershey Pennsylvania and Hersheypark by visiting the Pennsylvania category here on our travel blog.